Chocolate is certainly at the top of my list of favorite foods. The only way to make it better is to add a little salted caramel. Whooo Weeeee! 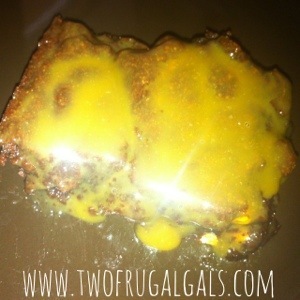 A few weeks ago, one of my sweet high school girls asked me to make these brownies for our mid-week bible study. When she told me they had pretzels and caramel, I was in! They were so delicous. Preheat your oven to 350 degrees. 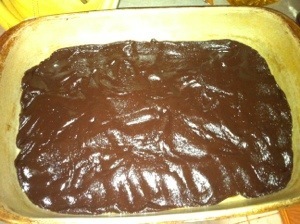 Spread half of your brownie mix in the bottom of a well-greased 9X13 pan. 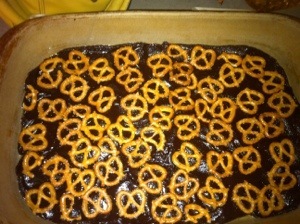 Lay your pretzels evenly over the brownie batter. 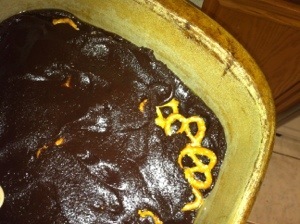 Put the remaining batter on top of the pretzels. Bake for about 20 minutes. 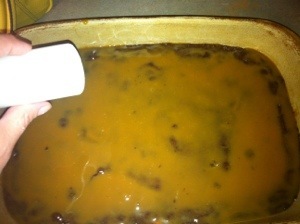 Pour 1/2 cup of caramel sauce over the top of the brownies while they are still hot. Sprinkle with salt. Let cool.